Can You Eat Avocados and Lose Weight? Avocados are often avoided by dieters because of their high fat content. 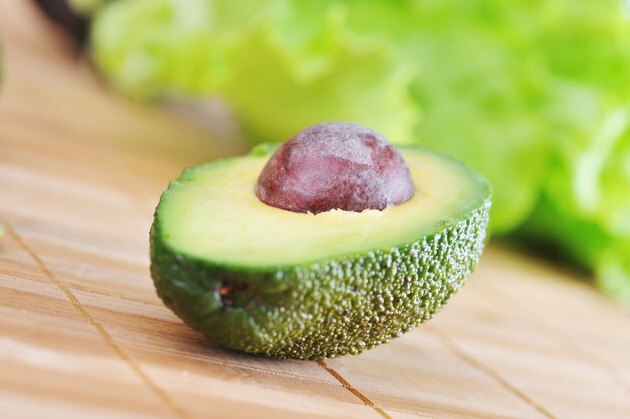 Although avocados offer more fat than most other fruits or vegetables, you must consider the type of fat they contain and the other nutrients provided. Avocados can be part of a weight-loss diet as long as you practice portion control. Avocados contain 4 g of protein, 15 g of carbohydrate and 31 g of fat, explains registered dietitian Joanne Larsen on Ask the Dietitian. The fat in the avocado is largely monounsaturated, which the American Heart Association notes can help lower your blood cholesterol levels when used in lieu of saturated and trans fats. According to the California Avocado Commission, a 1-oz. serving of avocado provides only 0.5 g of saturated fat and no trans fats or cholesterol. Use avocados in moderation, just as you would any other type of “good” unsaturated fat. Fat is an important part of any diet as it helps you regulate hormones, pad internal organs, promote skin and hair health, and facilitate vitamin absorption. You should include between 20 and 35 percent of daily calories in the form of fat, according to the Institute of Medicine. If you include half of a standard avocado in your daily diet, you are taking in roughly 15 g of fat. Since 1 g of fat contains nine calories, if you are following a reduced calorie diet of 1,500 calories per day, this is only equivalent to135 total fat calories or 9 percent of your total daily calories—meaning you have room for more fat in your diet in addition to that avocado half. Fat takes longer to digest than carbohydrates, so including some in your diet in the form of avocado can increase your feelings of satisfaction and fullness and thus preventing binging, Larsen also notes. Avocados are a good source of vitamins B6, C, E and K. They also provide you with folate, potassium, magnesium and lutein. Use avocados to replace saturated fats and promote weight loss. Use avocado in an omelet instead of cheese. Add to a sandwich in lieu of mayonnaise. Include on a salad with salsa and black beans for a meal full of healthy fats. At a party, enjoy a small side of guacamole with baked chips or diced vegetables instead of cream cheese-based dips. When following a low-calorie diet for weight loss, it can be hard to obtain all the proper nutrients needed for daily function. Avocados can help make the most of the calories and nutrients you do take in by assisting with their absorption. Researchers from the Department of Food Science and Technology at Ohio State University published a study in the Journal of Nutrition in March 2005 showing that including avocado on a salad helped participants better absorb carotenoids present in vegetables and salsa. Carotenoids are a valuable antioxidant associated with a lower risk of certain cancers, cardiovascular diseases, macular degeneration and cataract formation. Does Eating Avocados Lower Blood Pressure?